I’ve been reading a lot about World War II. As an archival processor in Swem’s Special Collections Resource Center, I’ve encountered many personal histories connected by the conflict: lonely soldiers far from home, young women residing with newly acquired in-laws, breathtaking descriptions of wildlife in the Yukon Territory. Each letter is affectionately addressed: My Dearest Hubby; To Sis and Ralph; Hi love. Though the correspondence concerns the war – Russian and Japanese engagement, poor training camp conditions, the Lend-Lease Act – the main focus is the comfort (and creatures) of home. As is often the case, processing these materials requires some detective work to tease out wartime family dynamics that might interest future researchers. 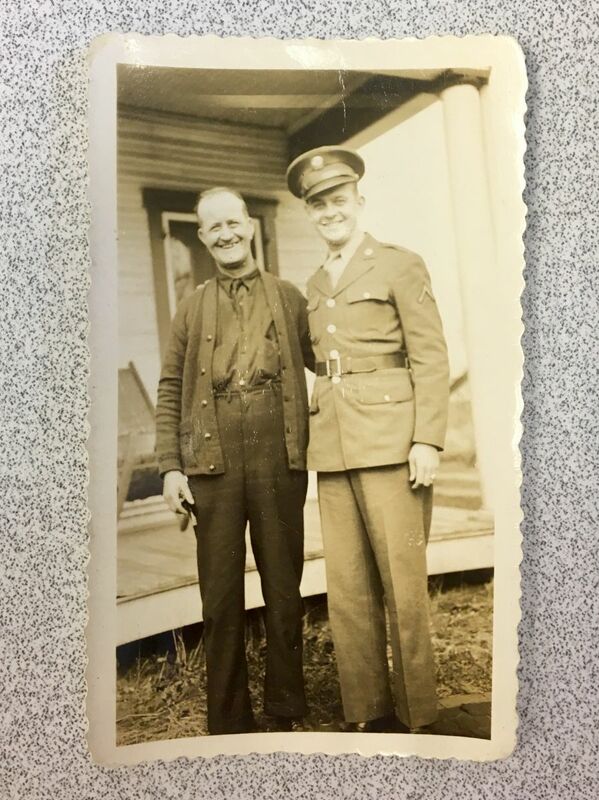 While processing one such collection, the Ellis D. Lovern Letters, I noted the frequent closing to his letters: “Love from Elmer to Susie and Nancy.” I knew Lovern signed his name “Elmer,” and I identified Nancy as his young daughter, born in 1942. 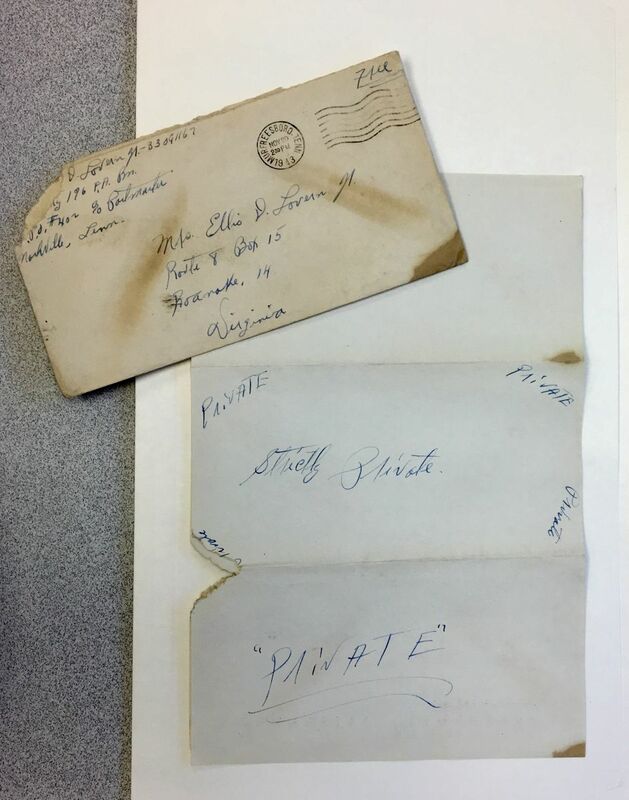 His wife’s name was Ruby (née Eanes) Lovern, and she was addressed directly in the letter openings – there’s little to no chance that “Susie” was an endearment for Ruby. So who was Susie? I considered the likely possibilities: was she another child, a sibling, a distant relative living with the Lovern family? Only one thing was certain: Susie received Elmer’s love and affection too. 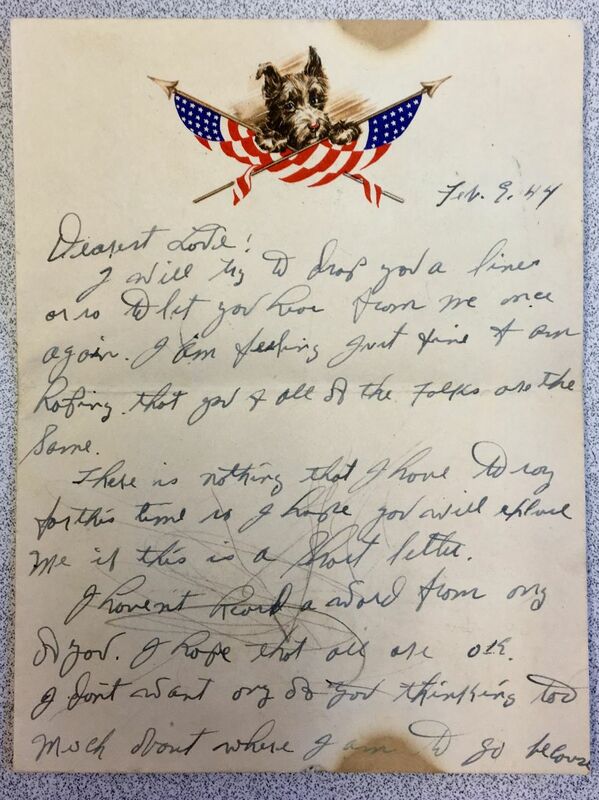 “Patriotic Pooch” stationery, Ellis D.
There is one clue: a short note from Elmer, written on stationery featuring a scruffy puppy adorned by two American flags – could Susie be the Loverns' pet dog? This might explain the infrequent mentions in the main letter text but important placement in Elmer’s closing endearments. Dogs are also members of our families – why not acknowledge their importance in communications between home and away? I came to this one possible conclusion re: the “Susie” question, but it is not a definitive answer. If anyone has any ideas about the mysterious Susie, I would love to know your thoughts!